I am staying in Las Casas de la Judería, beside the Church of Santa María la Blanca. The hotel is in the heart of the old Jewish Quarter of Seville, and the church was one of the principal synagogues in the area. So, this is an ideal location to wander through the Jewish Quarter, with its cobbled streets, narrow alleyways and twisting paths, retracing the footsteps of the Jewish community of the city. With the quaint charm of the area, its brightly-pained houses, boutique shops and many tapas bars and cafés, it is disturbing to realise that these walls and streets hide a dark history of deceit, destruction, death and the final expulsion of the Jewish community from Seville. The Jewish Quarter lies between the Puerta Carmona and the Puerta de la Carne, and it includes the Barrio de San Bartolomé neighbourhood. The central square, Plaza de Las Mercedarias, is surrounded by many attractions including the Convent de las Mercedarias and the former Parish Church of the Barrio de San Bartolomé El Viejo. There is an ancient tradition that the Jewish presence in Seville dates back to the destruction of the first Temple in Jerusalem 586 BC. Several influential Jewish families in Seville, including the Abrabanel family, claimed to be descendants of King David. There has even been some speculation that Jews settled in this region as far back as the 11th century BC a tradition that rests on the identification of Seville with the port of Tarshish: ‘For the king had a fleet of ships of Tarshish at sea with the fleet of Hiram. Once every three years the fleet of ships of Tarshish used to come bringing gold, silver, ivory, apes, and peacocks’ (I Kings 10: 22). The Jewish district began with building a wall in mediaeval times that separated Jews from the rest of the city. This fence begins at Tintes street and travels through the Plaza de Las Mercedarias, ending at Mateos Gago. The Visigoths (400-710) brought Christianity to Seville and the presence of Jews in the city is clearly documented from that period. The Sephardic Jews suffered under the Visigoths in the sixth century AD, with Isidore of Seville writing anti-Jewish polemics in the seventh century. This was followed by a period of harmony under Moorish rule, during which Jews, Moors and Christians co-existed, respecting each other’s religion and holy days, each with their own skills to offer. The Arabs began to occupy the Iberian peninsula from 711 on, and when they conquered Seville in 712, it became the second most important city in the Ummayad Caliphate, after Cordoba. Seville prospered and the city’s Jews who lived there were engaged in commerce, medicine and the dyeing industry. The Judería, or Jewish quarter emerged in the western part of the city. The al-Shawwār Gate, known as the Judería Gate in the Middle Ages and later as the Puerta de la Carne (the Meat Gate), marked the boundaries of the quarter. 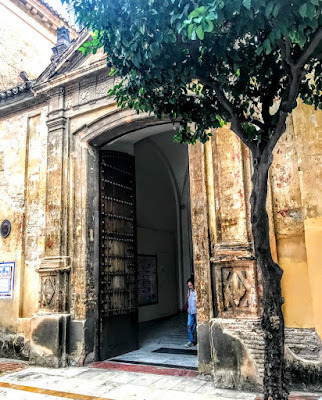 Seville provided a refuge for Jews escaping from Cordoba after the Berber conquest in 1013, and the Jewish population of Seville increased in the 11th century after anti-Jewish riots in Granada and with the arrival of large numbers of Jews from North Africa. Prominent Jews served in the court of the Abbasid dynasty (1023-1091). The wealthy scholar Isaac b. Baruch Albalia was the court astrologer and head of the Jewish community. Abraham b. Meir ibn Muhajir also served as vizier and head of the Jewish community under the Abbasid king. Important families included the Ibn al-Yatom, Ibn Kamneill, Ibn Mujahir, and the Abrabanel families. Al Mutamid made the tragic mistake of inviting the African Almoravides into Andalusia to assist in defending Seville against the Christians from the north. The fanatic Muslim sect eventually expelled the king and took power. Seville was a major cultural centre under the Almoravids in the 11th century. Abu Ayub Sulayman ibn Mu’allim of Seville was court physician and Abu al-Hasan Abraham b. Meir ibn Kamneil was a diplomat under King Ali ibn Uūsuf (1106-1143). The poets Abu Sulayman ibn Mujahir and Abul al-Fatḥ Eleazar ibn Azhar and the scholar Meir ibn Migash lived in Seville in the early 12th century. Eventually, however, the Jews of Seville fled the fundamentalist Almohads in the early 13th century. 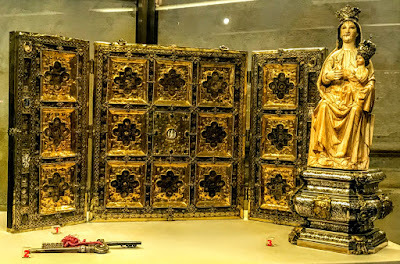 When Seville was reconquered by the Christians in 1248, the Jews of the city welcomed them with open arms, and they presented Ferdinand III with the keys to the city, now preserved in Seville Cathedral. For a period, the Jewish community experienced a revival, with about 200 families. These Jews in Seville spoke Ladino, a Jewish dialect of Spanish. The Sephardim, who had higher literacy than many other Spanish communities, prospered in banking, medicine, law and commerce. A second Jewish quarter was established, from the Carmona Gate to the Cathedral. The main street of the Jewish quarter started in the Puerta de la Judería, later the Puerta de la Carne and ended at a gate in front of San Nicolás, extending along Calle Santa María la Blanca, where I am staying, and further along Calle San José. The busiest part of the quarter was the square that is today called Plaza de Santa María la Blanca, and important streets included the Cruces street and the streets of the Levíes and Archeros. 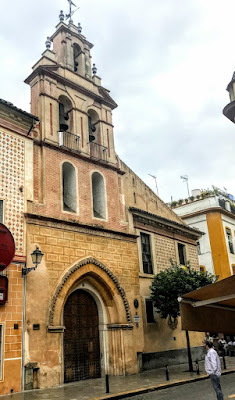 The present Church of Santa María la Blanca, next door to the hotel, was a mosque before it was given by Alfonso X in 1252 to the Jews to use as synagogue. The main synagogue stood on the present Santa Cruz Square, but was demolished in 1810. Other synagogues included one that became San Bartolomé Church, and another at Madre de Dios Convent at Calle San José. The Jewish cemetery of Seville was located where the Colegio de Potacoeli now stands. A full-scale pogrom broke out on the night of 5 and 6 June 1391. The entire Jewish community was attacked, the Jewish quarter in Seville was burned, synagogues were converted to churches, and thousands of Jewish lives were lost. Houses were plundered and burned, many families fell victims to the mob’s fury, and many Jews accepted forced conversion and baptism to save their lives. A once vibrant community never recovered. The archdeacon counted 23 synagogues in Seville, and claimed he destroyed all of them. But he may have exaggerated his numbers and included yeshivot in this number. The main synagogue was converted into the Church of Santa María la Blanca. Another synagogue, also in a former mosque, became the Church of San Bartolomé. Many Jews from Seville sought shelter with the Moors in Granada. Those who were forced to convert to Christianity and baptised were known as marranos, a pejorative term referring to pig eaters; converted Moors were known as moriscos, and both groups were called conversos. But the new converts suffered new persecutions and measures were devised to catch marranos secretly using forbidden Jewish religious practices and tests were devised to challenge the sincerity of conversions: Did he eat pork? Did she cook on the Shabbat? The Spanish Inquisition began in 1481, with its headquarters at the Castillo San Jorge in Seville. All Jews who had not converted to Christianity were expelled from Seville in 1483; and in 1492 the expulsion of all remaining Jews in Spain was ordered. Half Spain’s 300,000 Jews left, many for Portugal, others for Amsterdam and the Ottoman Empire. Some families took with them the keys to their house and would pass on this treasured possession down through the generations. But some stayed in hiding, and many Jews who remained eventually integrated into the Christian population. It is said many Spanish surnames ending in -ez indicate Jewish ancestry. Under Spanish Civil Code Art. 22.1, the government created concessions for gaining citizenship to nationals of several countries and Sephardi Jews historically linked with Spain, allowing them to seek citizenship after five years rather than the customary ten required for residence in Spain. Later this was dropped to two years, and in November 2012, the residency requirement was eliminated completely. Today, Seville has a population of about 700,000 people, but there are very few Jews here today. But some of the names of old Jewish families in the Jewish Quarter are remembered in this hotel, such as Casa de Mose Bahari. 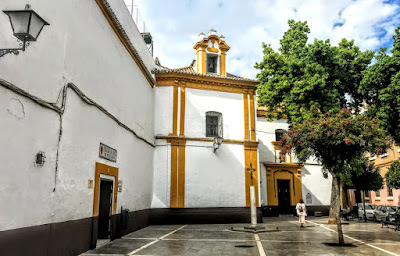 But the stories of the Jewish community are told vividly in Centro de Interpretación Juderiía de Sevilla on Ximenez de Enciso, around the corner from my hotel, and can still be found in the hidden passageways, gardens, and churches in this area that retains its unique charm. I am booked on a three-hour walking tour of Seville, the capital of Andalucía in southern Spain, this morning [Wednesday]. This tour promises to be an opportunity to learn about the city’s Islamic past, Christian roots and Jewish legacy. 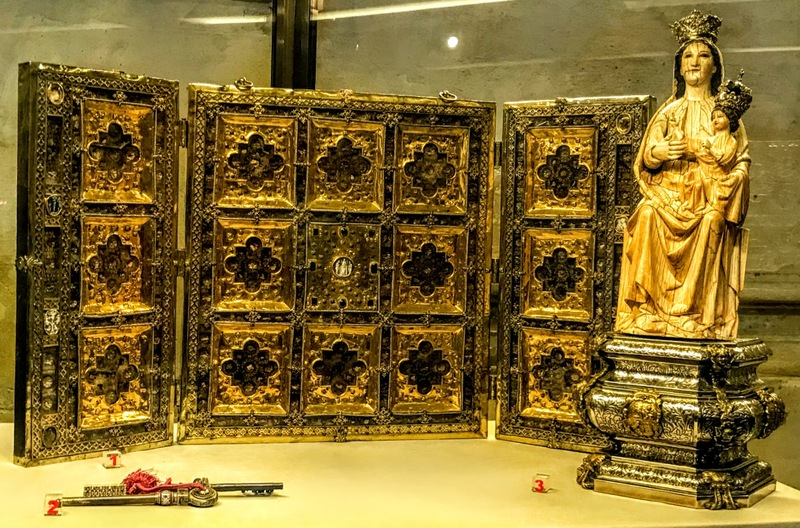 The tour begins at the main door of the Archivo de Indias on the Avenida de la Constitucion, and includes the Royal Alcazar, once the seat of many dynasties and home to three palaces, with its royal chambers, centenary gardens and chapels. We are also visiting the bell tower La Giralda and ending the walking tour at the Door of Forgiveness of the majestic Catedral de Sevilla, the world’s largest Gothic church and the third largest cathedral in the world. The cathedral is built on the remains of a mosque, and has a history stretching back 900 years. 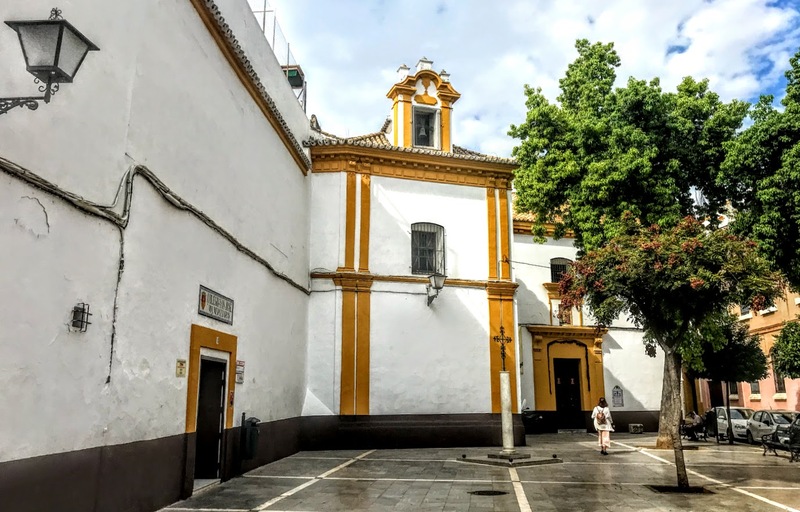 On the same square as the Cathedral and the Giralda stands the Convento de la Encarnación (the Convent of the Incarnation), another major religious site in Seville. It was built in the 14th century in the Mudejar style and its façade has been preserved, along with its chapel and tower. It was here that Doña Josefa Eugenia Maria Francisca Comerford MacCrohon de Sales (‘Josefina’ de Comerford) (1794-1865), the femme fatale in my family history, as forced to live an enclosed life for six years after her death sentence was commuted in 1827 to spending her life in an enclosed convent. An ultra-royalist rebel in the 1820s, the Regency had bestowed on Josefina the title of Condesa de Sales or Countess de Sales, a distinction later confirmed by King Fernando VII. I also hope to visit the Corral del Conde, once a large mansion on Calle Santiago and now an apartment block. It was here Josefina was allowed to live a secluded, almost hidden life after she left the convent in 1833. Seville was founded as the Roman city of Hispalis. It was later known in Arabic as Ishbiliyya after the Muslim conquest in 712. During the Muslim rule in Spain, Seville came under the jurisdiction of the Caliphate of Córdoba before becoming the independent Taifa of Seville. Later, Seville was ruled by the Muslim Almoravids and the Almohads until finally being incorporated into the Christian Kingdom of Castile under Ferdinand III in 1248. 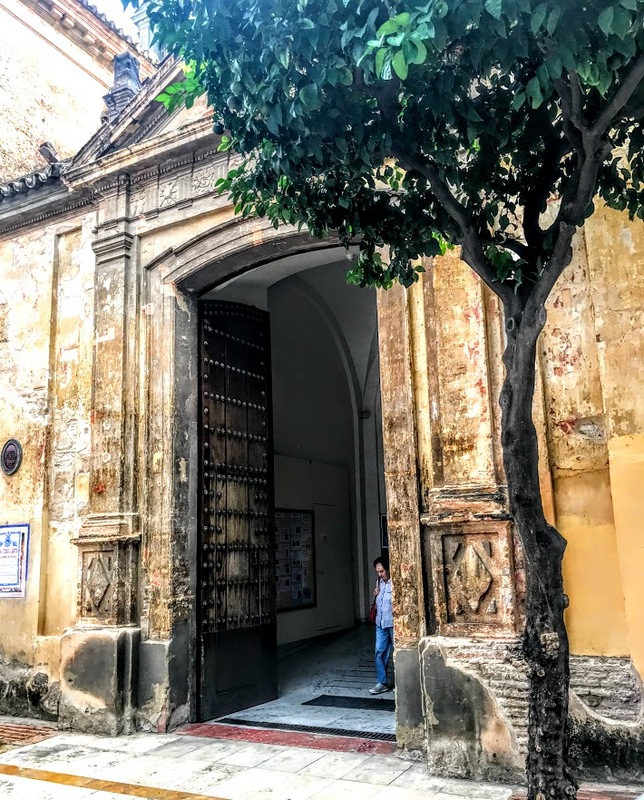 After the discovery of the Americas, Seville became one of the economic centres of the Spanish Empire as its port monopolised the trans-oceanic trade and the Casa de Contratación (House of Trade) wielded its power, opening a Golden Age of arts and literature. In 1519, Ferdinand Magellan left from Seville for the first circumnavigation of the Earth. The 17th century saw a flowering of culture in Seville, but it was followed by gradual decline as silting in the Guadalquivir forced trade and commerce to move to the nearby port of Cádiz. Tomorrow morning (Thursday), I plan to catch an early bus through Los Alcornocales Natural Park to the port of Tarifa, where Josefina lived for a few years during her early childhood. There I hope to take a ferry across the narrow Straits of Gibraltar, between the Mediterranean and the Atlantic, to Tangier in north Morocco. 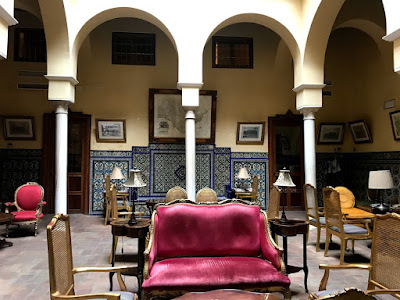 Stay with me for these few days as I explore these areas that link Spain’s Jewish, Muslim and Christian heritage, where Europe meets Africa, where the Mediterranean meets the Atlantic.